Cajeta (pronounced cah-heh-tah) is a delicious, sweet Mexican caramel sauce made from goat milk. It can be used in practically any way you would normally use caramel, such as for topping ice cream, dipping apples, or topping cookies or cake. My family's favorite is to eat it with a spoon out of the bowl! All kidding aside — if you plan to use your freshly made cajeta for a special dessert, be sure to hide it from the family, or be prepared to stand guard in the kitchen to prevent it from disappearing prematurely! The basic recipe is delicious as is, but you can also add flavorings for a special taste. Flavorings should be added after the mixture has cooked — otherwise, you'll cook most of the flavor out before it's finished! Cajeta is made by reduction and caramelization of a milk and sugar mixture. Begin by stirring the baking soda and cornstarch into a small amount of the milk, being sure to completely dissolve any lumps. Pour the remainder of the milk into a pot, and add the sugar, stirring to dissolve. Finish by adding the baking soda mixture. Bring to a boil over medium to medium-high heat, stirring constantly. Adjust the heat setting as needed to maintain a steady boil, without allowing the mixture to boil over. Continue stirring. The bad news is that the process is not a short one — you will need to dedicate approximately 45 minutes to an hour to stirring and monitoring the milk. The good news is that the heat releases that wonderfully unique goat milk smell that you can enjoy inhaling during the work! As the mixture thickens, it will begin to take on a caramel color. It's very important that you continue to stir constantly at this stage, or it may begin to stick to the bottom and burn. You can continue cooking until it reaches the desired consistency — whether you want it thin enough to pour, like a caramel sauce, or thicker, like a candy. Remember, though, to compensate for the fact that the sauce will thicken as it cools. When you're happy with the result, remove from heat and pour into a jar or bowl to cool. Use warm, or refrigerate for later. And, remember to padlock that refrigerator if you plan to use it later! You can see from the picture below that our original quart of milk produced about 1 cup of sauce, so you can adjust the ingredient amounts accordingly. Just like with goat cheeses, cajeta has that very subtle, wonderful flavoring imparted by the "goaty" fatty acids that sets it apart from caramel made from cow's milk. 1. 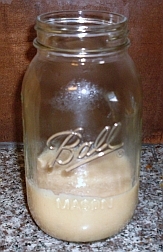 Since the milk is cooked, canned goat milk works just fine for making cajeta. So, you may want to save your fresh goat milk for a recipe where the taste will be affected more. 2. Save time by making a large batch and canning the extra. Boil the canning jars, lids and rings for ten minutes. Leave in the hot water until the cajeta is ready. Remove the canning supplies with tongs, and pour the hot caramel into the jars. Wipe away any drips from the openings of the jars, and close with the lids and rings. Cover the jars with a heavy towel and leave undisturbed until the lids seal (you'll hear a loud "pop"). 3. Need a gift for the person who has everything? Bet they don't have a jar of homemade goat milk caramel! Use decorative jars for canning in tip #2, and tie a ribbon and note around the top to make a gift they'll never forget. Articles are updated frequently, so check back here for any new information related to cajeta!